When I first got it, I didn’t realize how much I’d be using my Sony Reader to read library books. I absolutely love being able to borrow books online from the Chicago Public Library. Since I don’t have as much time to read as I’d really like, it hasn’t been too much of an inconvenience to deal with the waiting lists. In the past, I’ve been guilty of spending way too much money on books that don’t have a great shelf life. I like reading mysteries, and honestly, once you know who did it, the writing really has to be over-the-top excellent to be worth a second reading. I also like checking out best-sellers, and some (well, more than some) just don’t live up to the hype. Being able to borrow books that might not be keepers has definitely freed up some dollars for other, more lasting, enjoyments. The other nice thing is that they return themselves. You can return them before they are due, but if you don’t, they just magically become inaccessible on their due date. No fines, no trouble. The only real downside for me has been that annoying glitch which prevents borrowed PDF and borrowed EPUB books from co-existing on the Reader at the same time. And even that can be worked around with some planning. I have bought books for the Reader, as well as a few paper books. But I am really happy with the online library thing! …because it really is an important selling point to me. 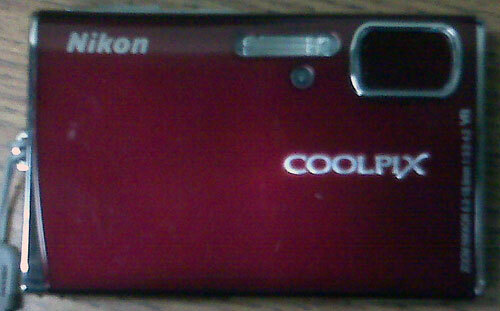 …the camera that took the first picture. My husband always knows what gadgets I should have, even before I know I need them. 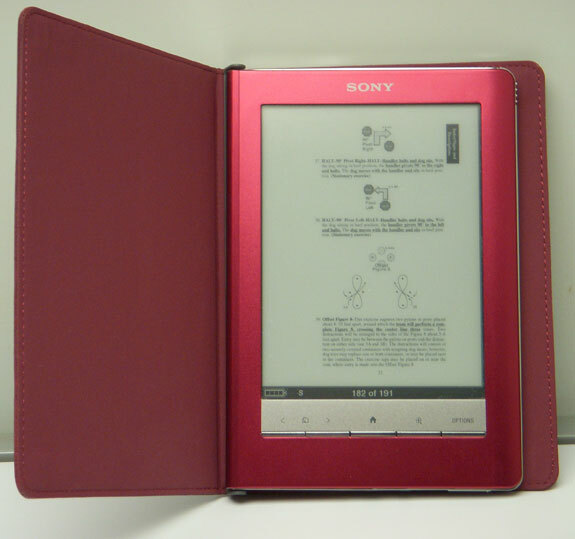 The most recent example of this is the Sony Reader Touch Edition PRS-600 that he gifted me with back in May. Now that I’ve been using it for almost three months, I can add my thoughts to the millions of words out on the ‘net on e-book readers. Sorry I haven’t been around as much as I should be. I seem to have lost my way this month, with a NaBloPoMo fail and a definite shortfall of Mingling and Blog Hopping. I’ll play catch-up as best as I can, but I think I’ll forego any more attempts at NaBloPoMo until fall! As you may already know, Freya’s training and trialing has not been a source of joy and wonder lately. A vet visit didn’t turn up any physical causes for our training and performance issues, but I didn’t have any lab work done at that time. I’ve been debating with myself about having a thyroid panel done. Her last one came back normal not quite two years ago. But she will be seven years old in November, so is now edging up to senior status (noooooooooo, she’s still my puppy girl), so at this point, maybe it is money well spent rather than a long shot. Hypothyroidism is also one of the only non-fatal things I can think of that could cause mood swings, hyper-reactivity, and weight gain (in her case a more subtle inability to get back to her ideal weight… hmmm… a problem for me, as well). Anything else I can think of is either much scarier, or else points back to me sucking big time as a dog trainer (this is actually the most likely possibility). Speaking of health tests, I still need to get Axel in for his OFA cardiac clearance. I have been holding off in hopes of a cardiac clinic being offered at a nearby show, as the cost savings would be very significant (try at least 50%), especially if the clinic is also doing Dopplers. Since there have been no known heart issues with his parents or siblings, and I don’t have any immediate breeding plans for him, I guess it won’t hurt to hold off just a bit longer. I know I’ve mentioned this before, but I’m going to mention it again anyway since it’s one of the things that has been eating up my time this month. Please think about subscribing to The Total Rottweiler Magazine. 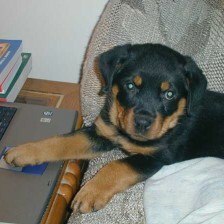 I am currently a volunteer (unpaid) proofreader and copyeditor for TTRM so I do admit some bias as I tell you it’s well worth checking into if you have any interest in Rottweilers and dog sports. So that’s the short version of what’s been going on. I have a backlog of Freya training videos to analyze and comment on, as well as a couple of hopefully more informative short rally obedience-related videos that I’m editing in iMovie as time permits. I hope to also have some Axel frisbee video soon. 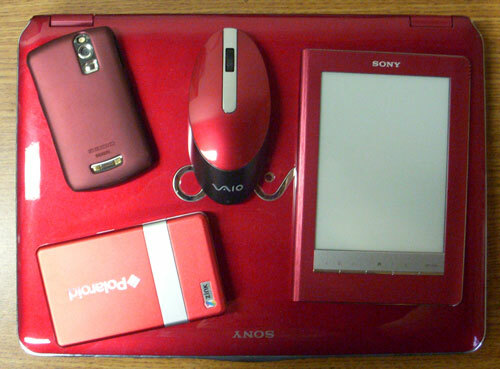 On the technology side, I have some MacBook and Sony Reader thoughts to post. Oh, and I did manage to fit in the upgrade to WordPress 3.0 as well. I know it isn’t supposed to be a main focus for this blog, but I still have some TV breaks that I never posted. Lucky for you all, some are no longer timely so you won’t have to read them, but at some point I still plan to tell you why Glee is the devil. I’m sure I’ll have at least a few new TV breaks once Rescue Me and Mad Men start up again on June 29 and July 25, respectively.